When the world spun itself from darkness, built from a single thought of the Alfathers, the Binding Words were written and the wisdom of a thousand ages were cast into the fiery memories of eternity. These words were carried to us by the Forever Voices and in a thousand afterlifes we shall relive its tale. I cannot tell you how to live, my brethren. All I offer is the wisdom of gods more great then we. Live well, each day, their secrets are yours. Cherish the gift of the heavens and divine righteousness will never be robbed from you. Be right and just and no foe can undo your glory and courage. - Ak'bahn Tochemik, Shaman of the West People and Keeper of the Wind. 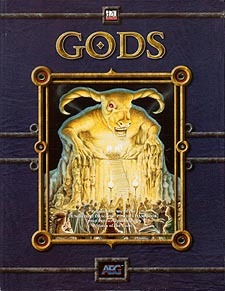 This sourcebook contains the gods of dark elves, orcs, minotaurs, trolls, and even monstrous aberrations that have no religion. 16 different races are detailed within, providing DMs and players with information and rules about the divinity of their adversaries. Each chapter details a separate race, with enough information to fuel an entire campaign or just a few evenings of gaming. The secrets of divinity are at hand.